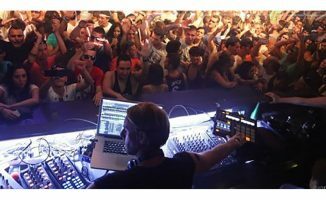 Over To You: Can I Add A Controller To Traktor Just For Effects? Adding an Allen & Heath K2 to your set-up would give you extra controls. Because Traktor can be Midi mapped, you can add pretty much any Midi controller you like to it in addition to your S2, to control pretty much anything you like about it! So adding a Midi unit to use as a Traktor effects controller is perfectly possible. I’d definitely recommend grabbing a copy of the book The Traktor 2 Bible to demystify mapping, but if you’re prepared to roll your sleeves up, this is all possible. For instance, you could add an Allen & Heath K2 and use it just for effects (the sound card would be redundant, admittedly), or even something bigger. But rather than double-guess your options, I’d like to throw this one over to the readers. Do you find the controls available for effects limiting on your set-up? Have you added an external controller to get around this? Care to share any stories or observations with Perry? Please feel free to do so in the comments. Controller Clinic #8: Which Two-Deck Controller For Studio Use? Controller Clinic #17: Best Traktor Controller For Techno? I use a midifighter in 4 banks mode with the ‘instant gratification’ mapping. Essentially, 12 effects, with built in combos, that can be run through any of the 4 decks, and can also do holds etc. I’m thinking to grab an Akai MPK Mini for effects, will that be good? The Midifighter has a large community behind it , using it , playing it , enjoying it. This results in tons of GOOD mappings and online support. Adding a controller? Sure. There are tons of midi controllers out there. 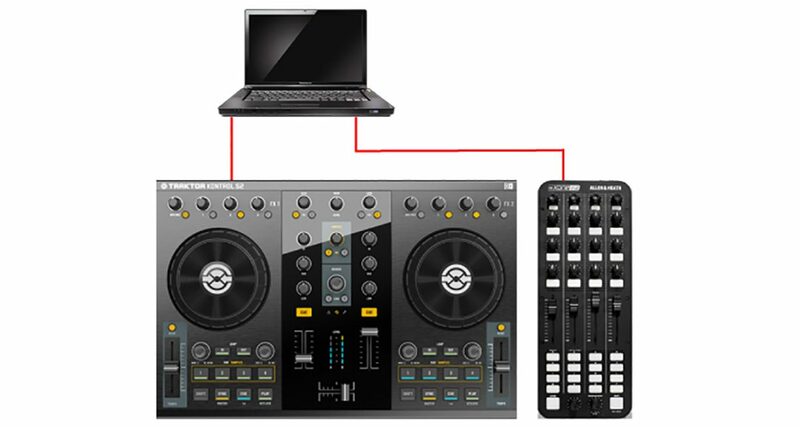 Every midi controller can be mapped to Traktor. I have NI Maschine which I use as a additional controller in my sets. Lots of knobs and buttons to be pushed 😉 I mainly use it for accessing various cue points fast. 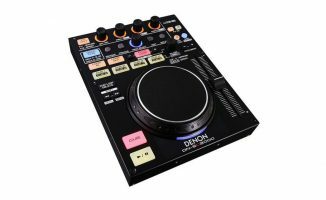 I money is an issue consider buying another DJ controller and use it as an effect unit. You could use the jog wheels for effects without double assigning your Kontrol S2. One thing I’ve noticed about the s2 is that people tend to ignore its midi mode. Pressing shift + shift will let it enter midi mode where you can map to your heart’s desire. I have mine setup where I can switch to midi mode mid-performance, pull off some effect combos, load up a new bank of effects, then switch back to the normal mapping and continue mixing. A very powerful and underrated feature if you ask me. I own an S2 and I was in your exact situation. I now have an Akai LPD8 as well. Each pad and knob on the LPD8 is mapped to each effect on FX 3 & 4. Absolute fun. Why did I go for it? It’s only $90. A launchpad is perfect for LED output – you can map almost anything from phase, beat phase, pre-fade output, post-fade output, trackend warning, crossfader position, clipping… you name it. I’m still working on the colours, as green, yellow, orange and red can be used on any of the 80 LEDs, and the results will be available on this site by next week I suppose. It is fun to work on it, and impressive to watch. 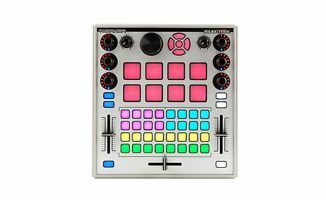 I’ve used a few MIDI controllers in the past for FX in Traktor – The best would be my MPD 24 – it has 16 pads, 8 endless encoders and 6 faders – the pads also have 4 banks so there’s countless combinations of mapping available. You can even copy some Midi Fighter mappings to the pads too. 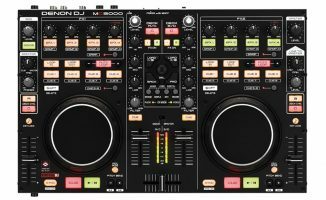 I’m using algoriddim’s Djay on my MacBook Pro, with Djay remote on my iPad, I’m thinking of getting a small controller like the dj2go just for the pitch sliders and cue start, since the iPad sometimes isn’t accurate because of the wi-fi or ad-hoc connection. After that, I’ll just use my iPad for controlling Djay’s effects with the x-y pad on the iPad App. I use an old dj controller (hercules mp3 e2) … it doesnt look ideal but you can map things how you want it… knobs as cross faders … faders and jogs for effects … why not try out what you have laying around instead of getting on the gear train and wasting 100+ on something… you might be able to do with something else?? Would you still happen to have that mapping for instant grat? I once had a gig coming soon and had no cash to buy a good second controller, so I just bought a numpad keyboard, (numbers only) and mapped it for sample decks, and effects, no knobs but the buttons can be set for increase, decrease and kill which was just enough until I had time to look for a proper one. I even painted it with acrylic and some nice colours to add a better touch and to help me remember what was actually mapped to what. 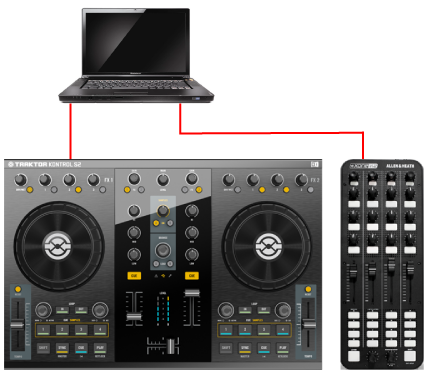 I have a Pioneer DDJ-T1 which I love, but found I sometimes needed a more compact set-up in certain venues. So, got myself a Xone K2 & set that for 3 layers of controls (mixer / cuepoints / effects), which works fine. But I found that I do like to be tweaking the effects while bringing in a new track… So now I have a Novation Launchpad mapped up in ‘user mode’ dedicated for the cue points & effects to run alongside the Xone K2. I’ve had those two controllers for a while now and love the portability of that rig. Would you be able to send or upload the mappings you use because I currently cannot utilize effects on the k2 and have to seperate units to control effects is the next step into having full control over traktor.. I use the TouchOSC App on my iPad as an effects unit. The app is available on iOS and Android. On iOS you can create your own custom layouts, which I have found perfect for using as an effects bank. The set up is pretty strait forward, and once you get through that, you midi map it just like any other controller. The only downside to this is that you need a wifi connection, however, if you are using a Mac, it is very easy to create a secure ad-hoc network. I cannot speak highly enough of this app. I agree with you. My controller (ReLoop Mixage) can control one effect at a time, but there is no easy way to switch between effects. I set up my iPhone with Touch OSC and all it has is 2 big up and down buttons to cycle through effects. Pretty helpful!! I use an Akai LPD8. It fits perfect between 2 battle style 1200’s and 10″ mixer (almost like they designed it this way 😉 ) I use it for all my cue points and effects so saves keep touching the laptop. Anything midi can be mapped to work for you with a bit of imagination and trial and error. I used for the fx one X1 and a Maschine Mikro with Instant Gratification mapping like the MidiFighter. Very effective and powerfull setup for the FX, i really love it! don’t forget the faderfox controllers. to control the FX section in traktor. Good point Mathias! Thanks for the reminder. I use an Akai MPD32 with custom mapping for Traktor. I would be happy to share the template file with anyone who “Likes” my Facebook page. Just send a message w/ your email address on FB.